Color a Whimsical World with Needle & Thread! There is no name more closely linked to ornate and fanciful fabric designs than Tula Pink. Sewists and quilters have long delighted in using her fabric to create whimsical sewn creations. Now hand embroiderers, too, can join the fun and stitch her signature designs with needle and tread! 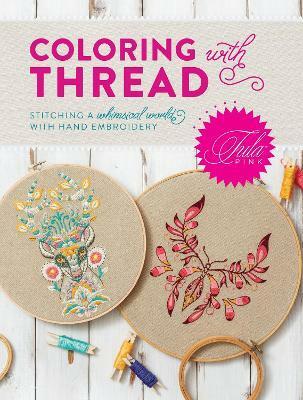 In Coloring with Thread, you'll find 17 of Tula's animal and floral designs from her best-selling fabric collections rendered and primed for hand embroidery. Step-by-step stitch instructions for over 20 embroidery stitches are included to help you bring adorable bunnies, chipmunks, octopi, and elephants to life right in your hands. Each motif features a color guide and thread color suggestions selected by Tula herself to insure a gorgeous finished design. Plus, you'll find every motif on CD-rom, where they are ready to size and print for your individual project needs. Whether you follow her color guides or make each design your own, you'll love coloring with thread and stitching the whimsical world of Tula Pink! Tula Pink is an icon of the fabric and quilt world. She has designed over 20 fabric collections for Free Spirit Fabrics, as well as thread collections, ribbon and trim collections, needlepoint kits, her own line of sewing tools, Tula Pink Hardware, and is an International Spokesperson for BERNINA sewing machines. She is the author of Quilts from the House of Tula Pink, Tula Pink's City Sampler, and The Tula Pink Coloring Book.